This customer required a tube cleaning system for a variety of tube sizes and lengths. Some of the tubes had complex turns. The process involved long stoke oscillation (in and out of solution) as well as lateral turbo, filtration and oil removal for the primary wash followed by on overflowing rinsing that also included long stoke oscillation, lateral turbo and filtration. The heart of the system is the adroit use of an elevator within the processing chamber. The elevator is used to transport the tubes into and out of the working zone (see below). However, its most important function is to position and move the components within the working zone. It is this aspect of its function that allows RAMCO systems to achieve superior results – better coverage and accelerated processing times. 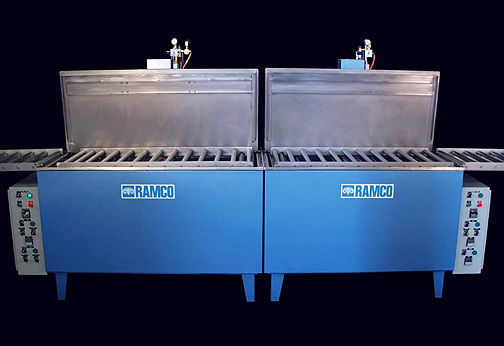 RapidFlow™ Tube Washing Systems are engineered for cleaning of tubes in the horizontal orientation. Tubes are preloaded into specially designed baskets and placed onto the elevator. The elevator moves the basket into the working zone and oscillates the tubes in and out of solution using a long stroke. The elevator oscillates the tubes in the proximity of the push header. The photos above and below shows the powerful flushing action. 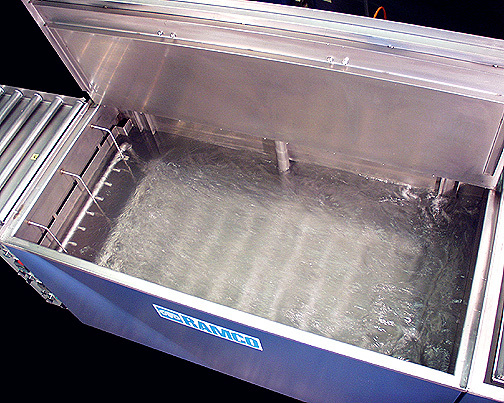 The push header (submerged to the left) directs the flow into the tube openings. 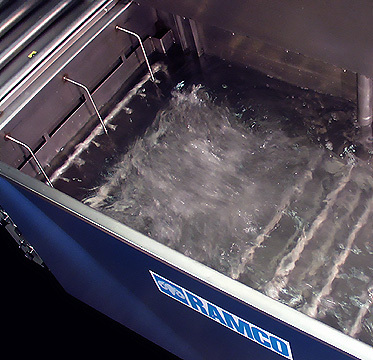 Would you like to see another RapidFlow™ system?